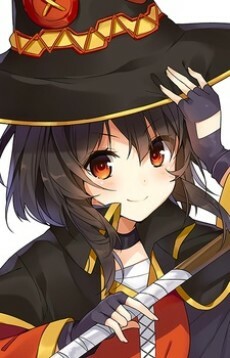 Megumin is an archmage and the self-proclaimed top genius of the Crimson Demons, an order of magicians who are born with high intelligence and magical powers. Despite being an archwizard she can only use the high level skill 'Explosion', the strongest of all offensive magic, and only once a day as it consumes tremendous magical power. Due to this she is more often a liability than an asset. Megumin speaks and dresses as a Chuunibyou and her only desire is to unleash explosion magic in the face of her enemies.